Iowa City, IA – In the wake of Hurricane Harvey’s destruction in communities throughout Texas and Louisiana, National Co+op Grocers (NCG) joins co-ops and other businesses nationwide in providing contributions to assist in relief and recovery efforts. On behalf of its member co-ops, NCG is donating a truckload of essential supplies from UNFI (United Natural Foods) to the Houston Food Bank, Houston’s largest food donation foundation. In addition, NCG has chosen an organization serving at-risk women and children in Beaumont, Texas, which is among the hardest hit communities, as the recipient of its annual holiday donation on co-ops’ behalf. “This is in recognition that those with the least in times of crisis are not just dealing with a lost way of life, they are often fighting for their lives,” said Robynn Shrader, Chief Executive Officer, NCG. Donations will be earmarked for organizations such as Feeding Texas and the Cooperative Development Fund, which assists hurricane damaged cooperative businesses of all kinds rebuild and resume operations through its Disaster Recovery Fund. As the changing climate continues to present us with unprecedented weather events that are taking a cumulative toll on entire regions, cities and human lives, NCG stands firm in its commitment to prioritize efforts to help reverse global warming through innovative projects like the Climate Collaborative and Co+op Forest. National Co+op Grocers (NCG), founded in 1999, is a business services cooperative for retail food co-ops located throughout the United States. NCG helps unify food co-ops in order to optimize operational and marketing resources, strengthen purchasing power, and ultimately offer more value to natural food co-op owners and shoppers everywhere. Our 146 member and associate co-ops operate more than 200 storefronts in 38 states with combined annual sales of over $2.1 billion. NCG is a winner of the dotCoop Global Awards for Cooperative Excellence and a Certified B Corporation. Find a map of NCG member and associate co-ops. To learn more about co-ops, visit www.strongertogether.coop. Here’s a conceptual rendering of our new store at 23rd and Marine Drive in Astoria’s Millpond; a location that’s been secured with a lease which includes construction of a new store. The new building will be about 12,000 square feet; four times the size of the current store. Read more about the site here. Our grassroots effort to make a bigger store a reality has sprouted! 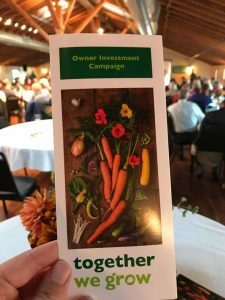 Our business, a consumer-owned cooperative, has launched an owner investment campaign called “Together We Grow”, and we’ve already raised $430,000! Preferred shares are an issuance of stock for Oregon residents who are Co-op owners. The shares are available starting at a minimum investment of $2,500. The Co-op is issuing 25,000 shares each with a value of $100 and is selling them to raise equity for the expansion. The annual dividend is 3% and for those who invest $10,000 or more the dividend is 4%. The Co-op’s portion of the project to build a new store at 23rd and Marine drive in Astoria, is about $3.8 million with a minimum of $1.5 million coming from owner investments. Co-op General Manager Matt Stanley feels the Co-op can beat its minimum goal of $1.5 million and is aiming to sell as many of the shares as possible, totaling $2.5 million. “The more folks invest the less the Co-op needs to go to traditional financing, so more dollars stay local,” Stanley said. The Co-op sources many goods from local producers and looks forward to growing the marketplace for local food. For every dollar that’s spent at the Co-op, 52¢ goes back into the local economy, according to a report by National Co-op Grocers. “I think of investing in the Co-op as truly investing in our community. You’re investing in me as a farmer and you’re investing in my business too. You’re investing in all these small local food producers. For us, that’s so meaningful,” Teresa Retzlaff of 46 North Farm said. The Co-op has been in the community for 43 years with a proven track record including double digit growth in the last five years and growing owners, recently reaching 4,000. This success has led to the Co-op needing more space and amenities. 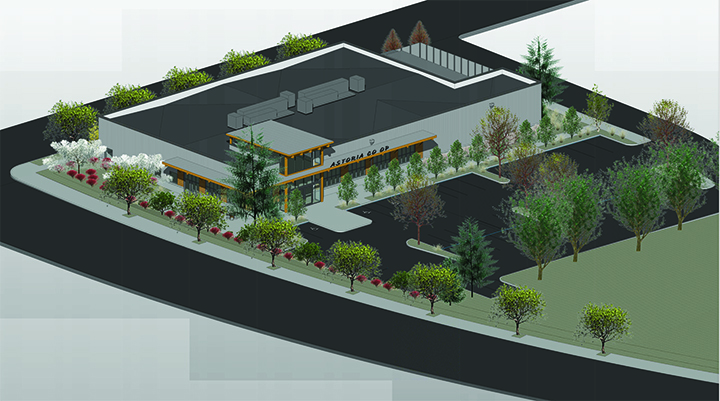 The new store will have a much-needed loading dock, more parking, a larger deli, fresh meat/seafood counter, and wider selection of organic and local produce. Expansion and investment information is available at www.astoria.coop or stopping by the store.